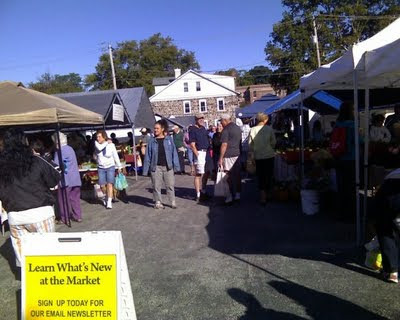 If you can't tell from the above photo, it was a perfect morning at the West Chester Grower's Market this past Saturday. The weather was cool but sunny, and the wares of the Market were enticing. As stated in last week's Preview Post, we stopped at Fennario, our local coffee shop, to grab ourselves some brewed caffeine and continued on to the corner of Church and Chestnut Street. We ran into some friends, which reminded me how wonderful it is to have community. I love showing up to a place each week where faces are familiar and people know my name. We all care about our Grower's Market, eating locally and supporting local agriculture. That, friends, is unity!